I have a thing for recycling. Not unusual–recycling is very popular right? 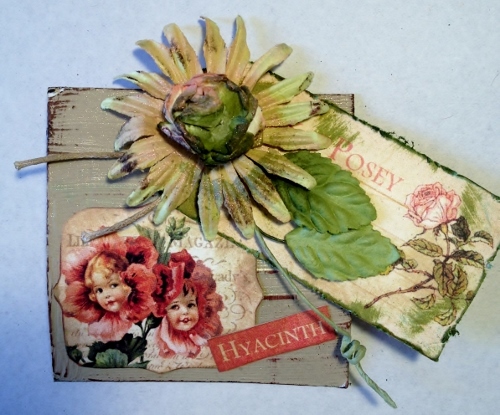 I recycle cans, and paper, and glass, and all the usual stuff but I have a couple of less usual things I like to recycle art-wise–non-styrofoam packing materials and clothing hangtags. I’m not sure why I’m so enamored of these two items but I am. Sometimes when I unpack a new item I’m almost more excited about the packing than the actual item. When I look at packing materials I see all the texture and layers and it makes my heart go pitty-pat. Sometimes it’s hard for me to put packing material in the recycling bin and I can totally see myself hoarding it but as you know my art shack is small so I can’t. Hangtags are my other weakness but on these I’m a bit more discerning. I don’t go for just any hangtag. They have to be a certain weight and it helps if they have interesting texture or pics or graphics or shape. 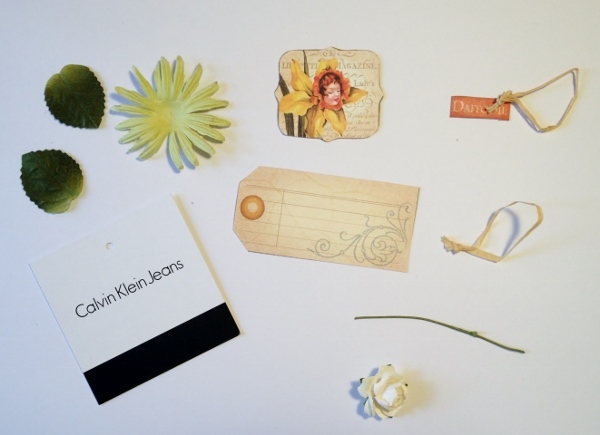 It’s amazing how creative companies are getting with their hangtags these days! 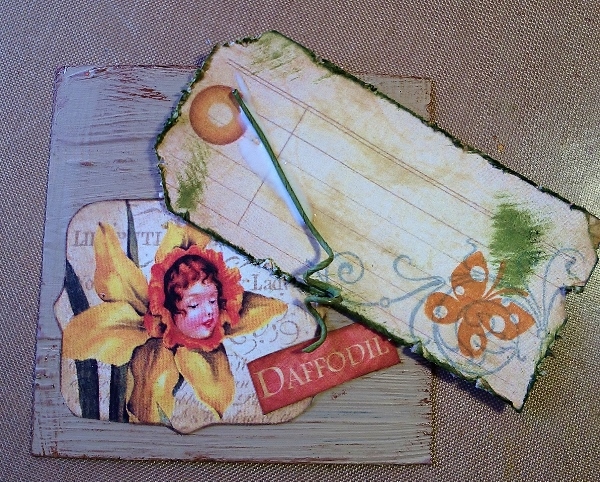 I really enjoy upcycling these tags into little works of art that I then use on greeting cards or presents. 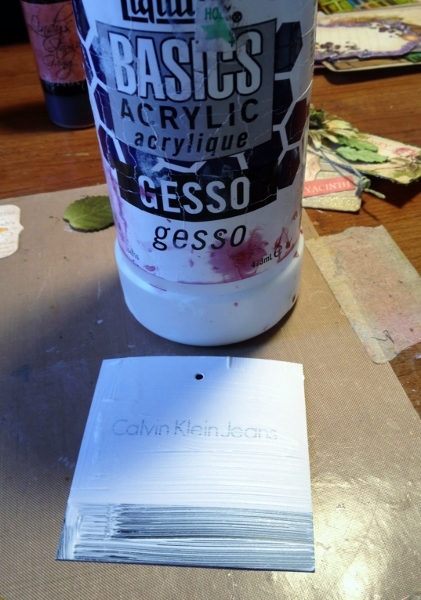 I first covered the Calvin Klein tag with gesso and then painted it with craft paint. I used a couple of coats of gesso and then covered the tag thickly with paint. I applied the paint with a foam brush and let ridged brush marks form for extra texture. 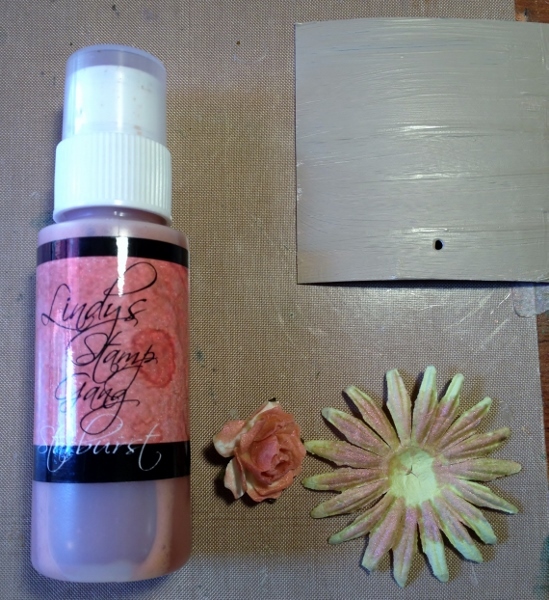 I colored my flowers with Lindy’s Stamp Gang Starburst dye using the foam stamping applicator tip. I then spritzed with water to allow the color to blend a bit. 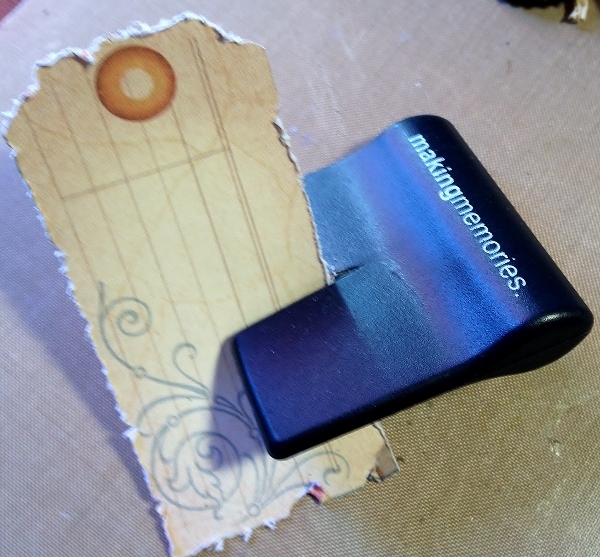 I like the distressed look so I roughed up the edges of my accent tag using my old school Making Memories distress tool. 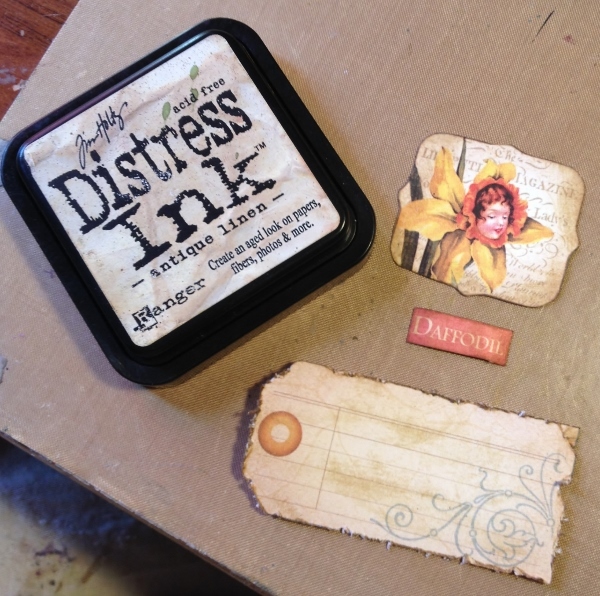 I also did some inking of some of my elements to get that grungy distress look. Then it was time to start putting all the pieces together. 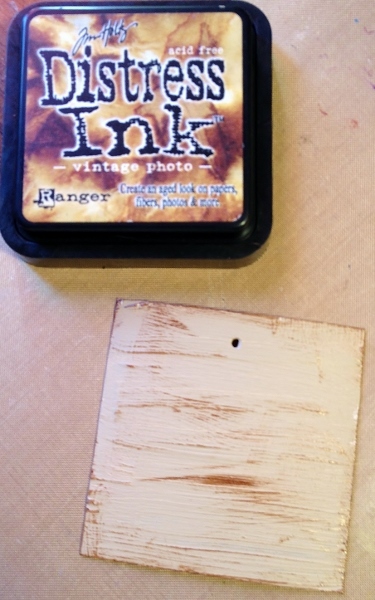 I really like the way my background looks like painted wood with all the texture and the graining highlighted by the ink. I use PVA glue to adhere most things. It dries clear and is virtually indestructible once it dries. 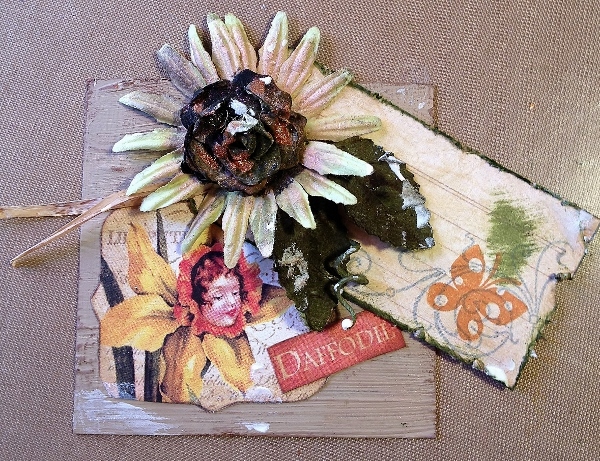 I added leaves and layered the flowers and a bit of raffia. 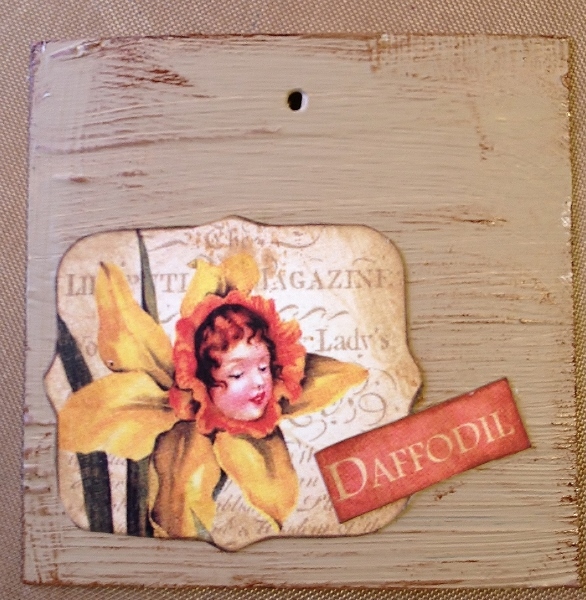 Also added a butterfly stamp to the accent tag. Put a few touches of gesso on a few areas to add a bit of shabbiness. 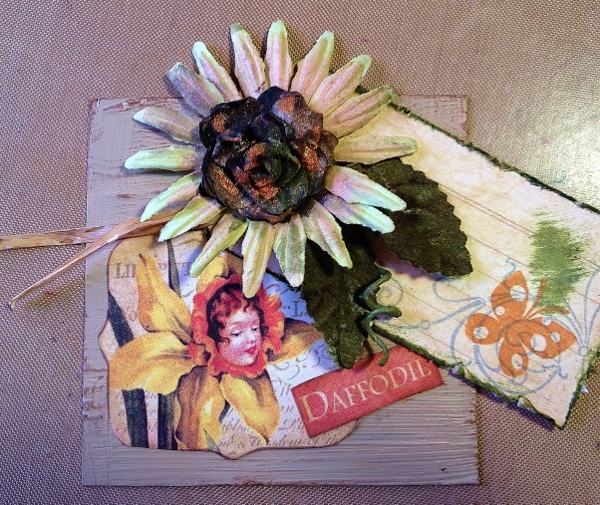 Here’s a couple of sprigs of spring! 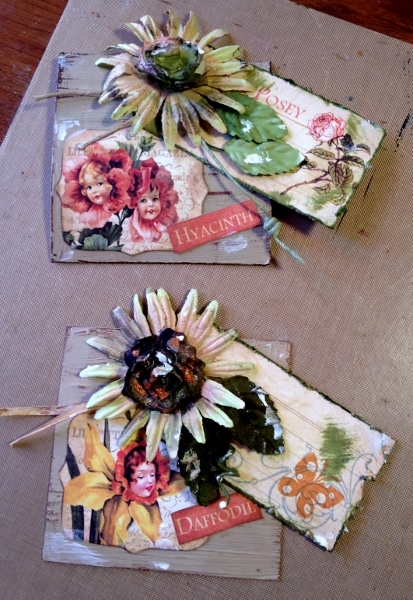 In my next post I’ll show you what I did with these tags! TFL!